K-pop’s international ascendancy was arguably more a matter of good PR than sales, but South Korea’s successful film industry, even if it’s mostly a local thing, is truly impressive. In 2013, a record 200 million movie tickets were sold in the country. In Japan, cinema attendance was 156 million. The difference becomes more stunning when you consider that South Korea’s population is about a third of Japan’s. According to the entertainment website Kscene, historical dramas are the hottest thing in Korea right now, and while Japan can still get excited over a decent jidaigeki, a recent NHK drama gave the impression that an emblematic component of the genre has all but disappeared. 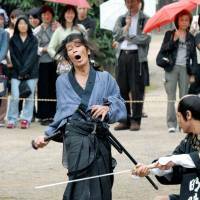 The hero of “Uzumasa Limelight,” a professional extra named Kamiyama, has made his living for half a century as a kirare-yaku in sword-fighting movies produced at Kyoto’s Uzumasa Studios. Kirare-yaku have a specific role: They live “to be cut,” as one veteran action protagonist in the drama puts it. Their job is to die on screen. Kamiyama, who is played by real-life kirare-yaku Seizo Fukumoto, is one of the greatest practitioners of the art, with a signature style of expiration. When struck, he bends over backward with eyes and mouth open to the heavens, and then falls on his back with a heavy thud. Kamiyama worked mainly on television series during the chanbara (sword-fighting drama) boom of the 1950s-70s. It’s obvious from his modest apartment that he never made much money, but he is a legend among his peers, who speak of him in awe. Throughout the drama he practices his technique every day, even though the studio is discontinuing its chanbara productions. Wrapping up a series that has been canceled by the network after 40 years on the air, the fictional show’s hero, who took over the part from his own father, bids farewell to Kamiyama. That doesn’t seem likely. While Kamiyama is relegated to entertaining tourists at the studio’s theme park, a new, young producer is changing with the times by concentrating on crime dramas. In a scene meant to indicate how little Kamiyama’s skills matter any more, he is chosen to play a bloody corpse in some sort of yakuza massacre. His only task is to remain still. When he can’t quite do that to the arrogant young director’s satisfaction, he makes a hostile gesture. The kid wants him fired. Even worse, the new producer is making a TV series with a rock star as the famous medieval warlord Oda Nobunaga. The show is entitled “Odanobu!” as if the bloodthirsty general were a pop star himself, and the actor clearly sees him as such, refusing to wear a chonmage (topknot) wig because it would make him look bald, opting instead for a luxurious kabuki mane that reaches to his knees. 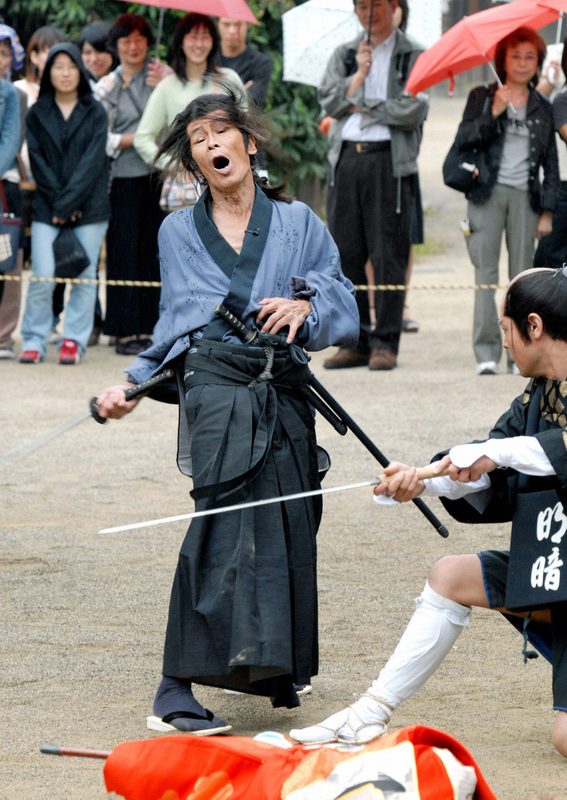 But what really seals the end of the chanbara era is the lack of expert swordplay. The actors carry stubby green weapons so that computer-generated blades can be keyed in during post-production. The choreographer has almost nothing to do, but there is some hope. A young girl named Satsuki, enamored of Uzumasa because her late father was a huge chanbara fan, asks Kamiyama to teach her everything he knows, and she quickly proves her value to the studio, and later the industry, by injecting some sorely needed technique into her action scenes. The title of the drama echoes the Charlie Chaplin movie about a celebrated theater actor in the twilight of his life. NHK apparently thinks this sentimental story about one of Japan’s most distinctive entertainment forms will be edifying to a wider audience, since it plans to release a theatrical version, possibly with English subtitles. So instead of hiring an experienced jidaigeki director, NHK recruited a young Japanese filmmaker, Ken Ochiai, who was trained in Hollywood. Working hand-in-hand with an American cinematographer, Ochiai has fashioned a film that is markedly different from the usual Japanese fare, whether on TV or at the movies. A week before the broadcast, NHK ran a three-hour documentary on the making of “Uzumasa Limelight” — an hour longer than the drama itself, mind you — that emphasized the differences between Hollywood and Japanese production methods. Most chanbara film technique was born of economic necessity. Film was expensive, so choreography and planning was important in order to reduce the number of takes. Hollywood directors tend to shoot a lot of takes and then shape the film in the editing room. This process clearly irks the veterans on the set, who expect to be directed down to the slightest body movement, but Ochiai leaves the acting to them. Of the two programs, the making-of doc was more interesting, and not just because it was more informative. The drama comes off at best as an interesting novelty. Whatever excitement the action set pieces in chanbara movies offer, the stories tend to adhere to a handful of basic plots that all end up in the same place. Ochiai’s American training results in a different set of visuals than you usually get with the genre, but which are nevertheless just as hackneyed as the mawkish plot points: training montages, reactive closeups, jump cuts that add motion but do nothing to deepen the meaning of the story. More significant than the stylistic contradictions, however, is NHK’s lack of reflective insight into what it sees as the end of a popular art form, since the public broadcaster could be accused of being instrumental in its demise. Its Sunday night historical serial has always been the yardstick against which all jidaigeki are judged, and for the last 10 years or so — and into the foreseeable future — Japan’s great figures of the past have been played by young men from Johnny & Associates and cute female idols in alternation, thus rendering historical dramas practically indistinguishable from everything else on TV.